Cute card & beautiful colors! Thanks for playing! Bunny, what a super sweet card, that image is adorable. You've colored that birdie so nicely! Thanks for joining us this week at Sentimental Sundays! 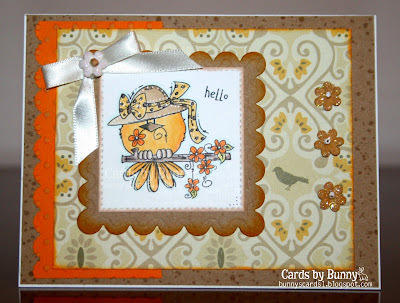 darlin card, luv your coloring! so glad you played along with Simon Says Stamp Wednesday Challenge! I love your card! It is so adorable! This is adorable. Love the colors with the sweet Bugaboo image. Thanks so much for joining Stella Says Sketch at Catch the Bug this week! Beautiful colour palette and card! Thanks for joining our Stella says Sketch challenge #308. Good luck in the draw, and please join us again soon!